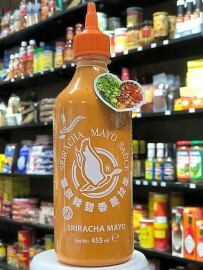 Flying Goose Sriracha Mayo Sauce. Vegan - contains no egg! Made with sunripened chilli peppers and without egg. Ideal as a dip for sushi, crackers or bread. 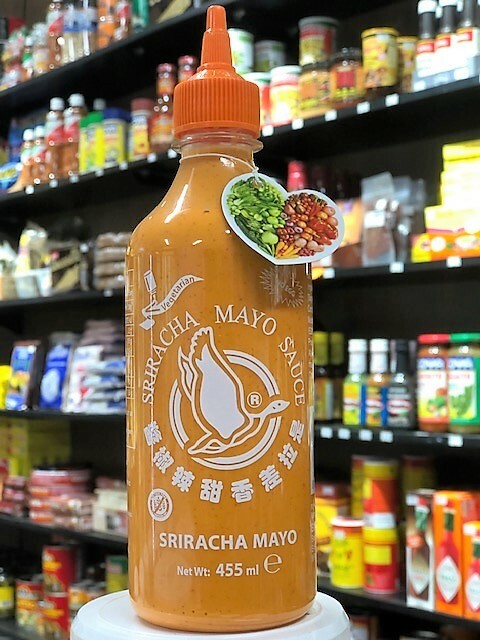 Flying Goose’s delicious Sriracha Mayo is a flavour-packed, spicy alternative to the more traditional egg-free mayo offerings currently on the market. It is perfect for adding an intense flavour to any dish but it is also great as a table sauce for chilli addicts. The fantastic thing about this brand is its body and the way the heat is perfectly balanced. Water, Chilli (20%), Soya bean oil (18%), Sugar, Vinegar (12%), Corn starch, Salt, Stabiliser, Garlic, Mustard seeds, Acidity regulator, MSG, Preservative: Potassium Sorbate, Antioxidant: TBHQ, Raboflavin.